Click here to find out how to get to heaven from the West Indies! It is our desire to shine the light of the gospel throughout the islands of the West Indies. 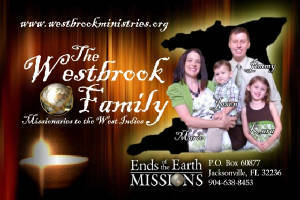 We began making trips to the region in the year 2000 and moved there as full-time missionaries in 2003. Our primary ministry is church planting and in 2004 we started Arouca Baptist Church on the island of Trinidad. We returned to the field in February of 2012 for our third term. We have been able to remain in the country since then and are now in the process of getting our residency. We put together a special video of various people in our church expressing gratitude to the faithful supporters of the work here in Trinidad. The video was filmed on a regular Sunday morning and people were invited to come and say whatever they wanted to the churches and individuals that support our ministry in Trinidad. I think it will be a blessing for you to see some of the fruit from our ministry and for you to hear the testimonies and words of appreciation from our people.